Each Spring we take our students to a Good Friday Processional downtown that is done by the Roman Catholic church. This processional is full of people who believe they need to do some kind of penance for their sins. The majority are men but there are also women and kids. 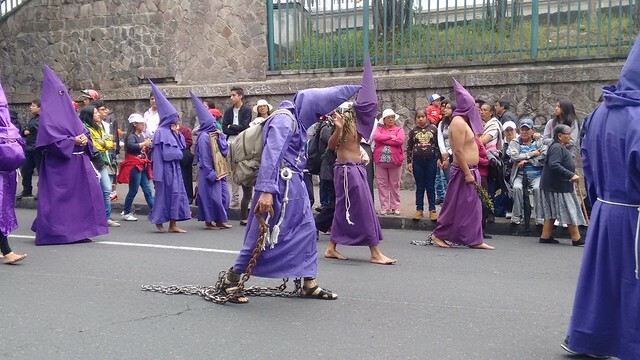 Most dress in purple and some wear the hood so that they won't be recognized. We prepare the students ahead of time, knowing it can be a deeply impactful experience. This year I really wanted to take the kids with, knowing that they are young and that it's a bit graphic, but also knowing that it is something that has stuck with me since I first experienced it as a kid. We take the trolley down and it's an interesting dichotomy because prior to the begining of the processional it's a festive, party atmosphere. Street vendors sell espumilla (egg white ice cream), coconuts to drink, huevos chilenos (fried dough balls), popcorn, chifles, little icons of the processional and so much more. People are in the streets running back and forth. 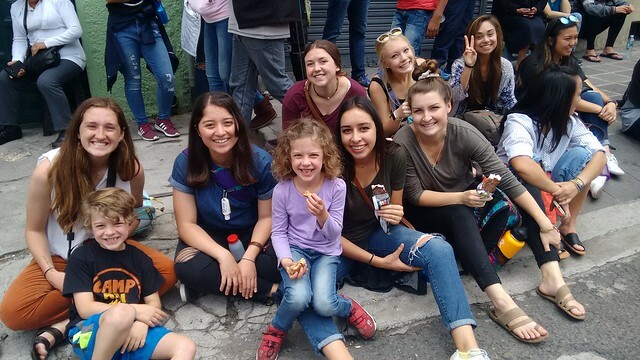 Below in that first picture you can see my students with their smiles and ice cream. But as the processional starts to come by the crowd turns solemn, somber. You watch the downcast faces of shame. Some wear an actual crown of thorns. Some choose to walk barefoot so as not to spare their feet from pain. 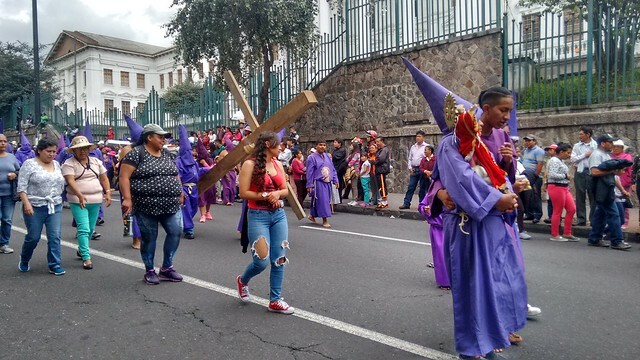 Many carry crosses, both big and small. We watched one young man carry an enormous cross, struggling to go a few yards at a time. In front of us he stopped and another man stepped in to carry his cross for awhile, but after just a few yards he gave up and gave it back to the first young man. There are those with heavy chains around their ankles. We watched a few go by who were whipping themselves as they walked. As I observed the scene and took it in for myself, I was also keenly aware of my students. One who came out of Catholicism had to step away and sit down, many had tears coursing down their cheeks. Nobody likes to see another person in pain. And particularly when it's pain that doesn't have to happen. But as a believer the real sadness comes in acknowledging that for most of the people in this processional, they think they know Jesus but they have no understanding of his grace, his forgiveness and so they earn their salvation through their pain. I wondered at the hurt Jesus' heart must feel watching that processional happen. Following the processional we head back to our neighborhood and the students eat "Fanesca," an Easter soup full of symbolism in each ingredient and we debrief the experience with them.